During the second half of the nineteenth century, the Industrial Revolution gave birth to Blake’s “dark, Satanic mills”, huge cathedrals of commerce producing cotton, wool, alpaca. Conditions in the mills were harsh – the workers started young and the hours were long, the work dangerous. The mills of the North were places to be feared, where spirits were broken and the hopelessness of Victorian poverty was everywhere. The mills are still there, but the industry has gone long ago, mainly to the Far East where wages are cheaper and regulation not as tight, to places where you can run a factory just like you used to in 1875. Of the mills that are left, many have been converted into apartments with high ceilings and big windows, others have been renovated in other ways. Salt’s Mill in Saltaire was one of the lucky ones, bought for peanuts in the eighties by a local entrepreneur who had two simple ideas, one sensible, one a little off the wall. Jonathan Silver would bring commerce back to the empty hull of Sir Titus Salt’s colossal mill. He would rent space to technology firms, who would use it to produce sophisticated electronics. New industry in an old industrial setting. He would also open an art gallery in the same building, pulling in favours from old friend and fellow Bradfordian, David Hockney. An art gallery in a Victorian mill. Ridiculous idea, doomed from the start. What Silver saw was that business and the arts could and should work together, that the same space, both practical and beautiful could serve both purposes. Pace electronics provided the commercial backbone of Salt’s Mill, the galleries attracted the people. The single gallery, large and airy, painted in warm reds and greens, hung with some of Hockney’s best work was a huge success and was soon followed by a bookshop, more galleries, a shop selling high end homeware where parents still hold their children’s hands very tightly for fear of breakages that would surely result in bankruptcy, and a restaurant. Salt’s Diner is one of three cafes and restaurants on the site today. As with everything at Salt’s Mill, it’s a large open space, hung with Hockney’s holiday photos, with an open plan kitchen, round wooden tables and Arne Jacobsen chairs in bold colours. The menu is a winning balance of British favourites (sausages from Lishman’s in Ilkley, mash, red wine gravy…really, who could resist that?) and Mediterranean dishes. Flavours are in keeping with the setting – big, and bold, but certainly not brash. 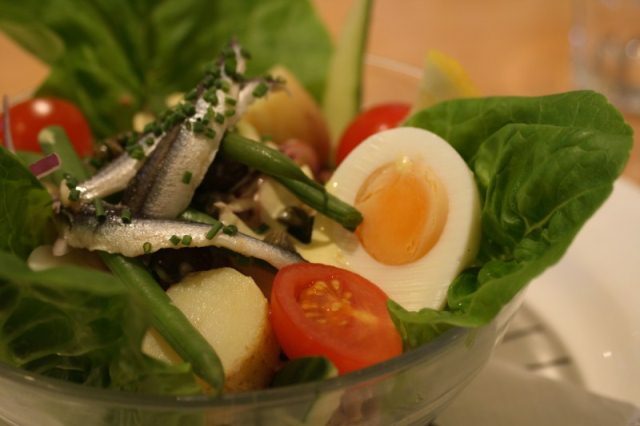 I had a salad nicoise of lettuce, tuna, tomatoes, perfectly boiled eggs, potato, garnished with fresh anchovy fillets. You’d have to go to France to get a better version. 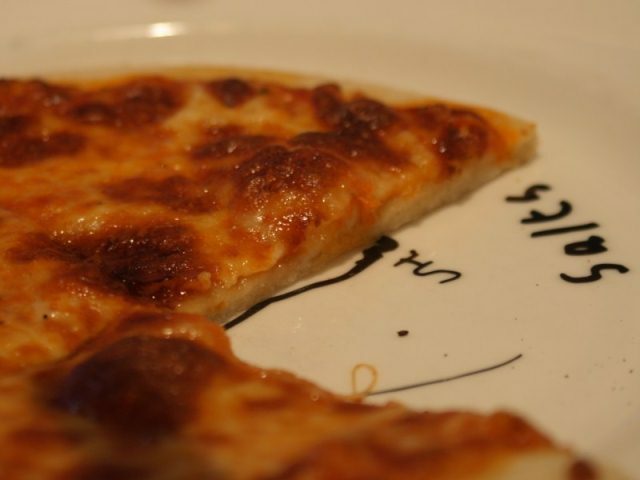 The kids had a pizza and spaghetti with meatballs, smaller portions of standard dishes. Well, not that much smaller, which gave me the opportunity to try more than my fair share of the spaghetti, which came in a rich tomato sauce with herby meatballs made from ground beef from the Bolton Abbey estate in the Yorkshire Dales, extremely high quality meat cooked beautifully. The pizza disappeared completely before I could sneak a slice. It was thin, the base crisp and scorched, cooked in an inferno of an oven. Superb. Other dishes included a delicious smoked salmon pate on rye bread and a triumphant burger, a staple of the menu from day one, a substantial patty of chargrilled, seasoned ground beef in a bun, served with everything you’d expect a burger to come with. 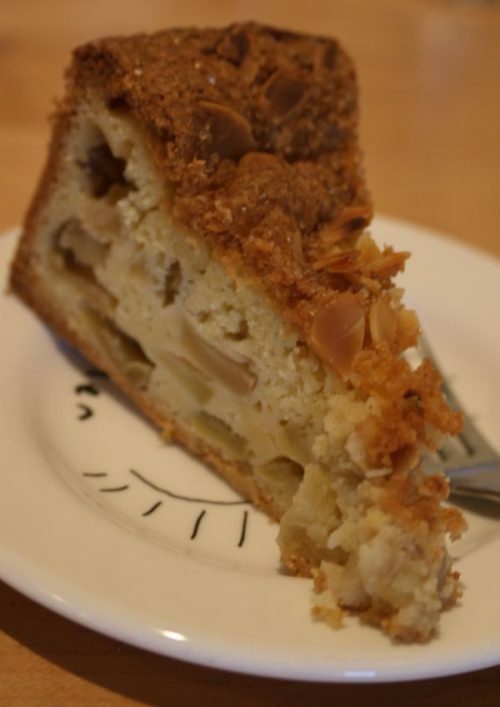 For dessert, I had a large slice of apple and almond cake, stodgy and tasty, crunchy on the top, pleasingly soggy at the bottom. The chocolate brownie came in slices about the same size as a house brick, bitter chocolate with a smooth coffee ice cream and a hazelnut sauce. The food is great, but the service has always let Salt’s Diner down a little. Waiters are friendly and responsive, but disorganised and slow to clear tables and take orders. It’s all just a little too relaxed and there doesn’t seem to be a ‘system’ in use. The waiter took our dessert order only after we’d gone to fetch him, as the kids became ever more tired of waiting for long-promised ice cream. He took the order before our table had been cleared down. It’s a relaxed place, and I didn’t really mind, but still, things should happen in a certain order. The food and surroundings more than balance any minor service related shortcomings. The Diner has excellent food, cooked well by a disciplined and consistent kitchen, and a dramatic and beautiful dining room, busy and bustling with life. It’s relaxed, welcoming and just the right place for a quick coffee or a long and lazy lunch.